The first warm day of spring! Together with my Mattie and our young relation, little Miss Elizabeth May Possons, we walk down into the village for some early afternoon ice cream and a chance to take in the first signs of the crocus emerging from under the last of the season's snow. She is a lovely girl, our Ellie May is, if I am not too prideful to say. She is quiet though. And thoughtful. She has taken to her great uncle (great, great uncle? I can't recall) with an uncommon fashion. I'm not certain why this is so but the answer never needs to be defined. Our family is large and there are many generations who have stayed and built their families here. It is the primary reason why my daughter and I chose to come back here after all those years in Manhattan. Family. I settle onto a bench out in front of the Chinese laundry and shoo the girls off to go about there way. A kiss on the cheek from both and they're off to wander about the various shops. From somewhere off, I can hear the strains of the village brass band practicing for the upcoming season of outdoor concerts. They're taking a run at one of the popular Sousa Marches. How an old man like me enjoys the new maestro is a bit unbecoming but I don't mind admitting it. Bundled up and feeling the warmth of the sun on my raised face, my eyes closed contentedly, I begin to think of the strange life I've lived. Two lives really. Or perhaps many lives! I'm dozing as I so often do now. I breathe in the fresh, cool air. The peal of children's laughter and their mothers' voices. Men in passing conversation with other men and the sound of horses chuffing and the creak of wagons. My thoughts are upon Ellie May. How she reminds me of Mattie in her temperament. And then it occurs to me that Ellie May is at the same age that Mattie was when I had her pose for the Anthony's prize daguerreotype. Of course! I smile at the memory as it plays out upon my eyelids. And then its on me. Such joy and such sorrow! He had been a neighbor of ours during our time living in Brooklyn. John Faris. A young Scotsman who had emmigrated to this country along with his two brothers to begin new lives for themselves. Industrious, intelligent and devout as his nationality is known for with a polite charm and a tousel of red hair. Oh, but it does pain me that Ben and I have grown so distant. But that is a story for another day. Years passed and the relationship between Mattie and John blossomed. Phebe was the first to see it. Long before they were anything but two playful, teasing young people, squabbling for each other's attention, Phebe told me she had a premonition. And I knew better not to take my wife's intuitions lightly! She had that way of knowing all too often. And there came a time when she confided in me her belief and hope that our loving daughter and this young man may see themselves grow to be as one. It did of course come to pass however our Phebe would not live to see it. Once more, a tale for another day. In time, he and his brothers' industry began to pay off and they found themselves partners in a wholesale concern. Agents brokering merchandise throughout New York and New Jersey. When his finances and future was secured, he did come to me to ask my permission in marriage to Mattie. It was one of the proudest and happiest times of all of our lives! On a crisp, late October morning in 1862 we celebrated the joy of seeing Mattie and John Faris married. The happiness and love between the two was never in short order. Of course there was sadness too. As much as there was the desire to have a family of their own, this was never to come about. Acceptance and the belief in leaving such answers as why to the all knowing sustained the both of them through this and all trials. Even, as it would come to be, in the worst of such trials. John Faris was a temperate man in all matters including his taking of alcohol and rarely was the ocassion when I saw him do so. In fact it often struck me as unusual, knowing how fond a Scot was for his native whiskey. There were often times when men in my employ would show up for work having had the smell on them and it offended me to the point where I ordered them off my premises. It was unhealthy and with all of the dangers that abounded within a photographic studio, it was too much to risk. 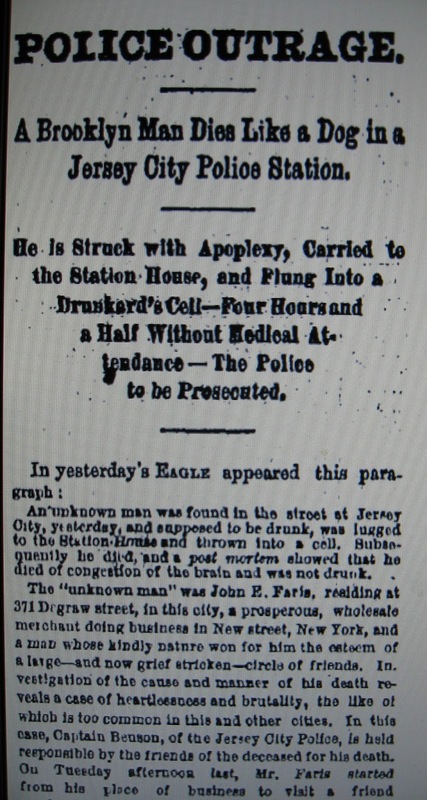 John Faris was never such an individual. 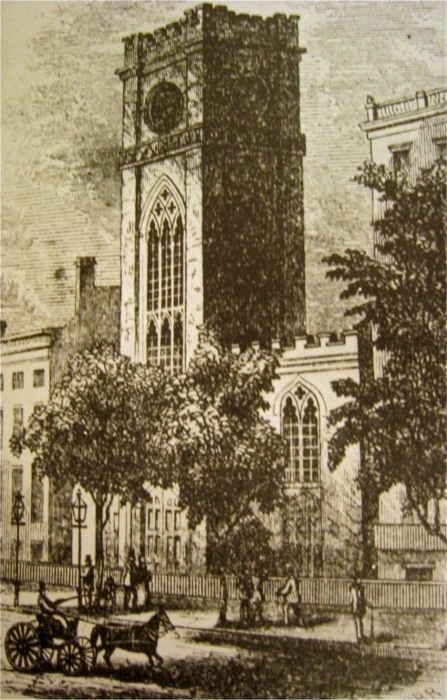 On an early summer afternoon in May of 1874, John set out for Jersey City. A ferry to Manhattan, a short omnibus across town and another ferry to the Jersey side to pay a visit on an old business associate and friend. Towards evening he began to make his return and then the worst of all horrible possibilities happened. This fine man and loving husband, suffered a bout of apoplexy and fell to the ground, injuring himself quite violently. 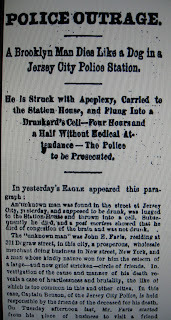 He was found some time later by members of the local police department and taken for a common drunkard! Brought to the police station, unable to speak on his own behalf, stripped of his belongings and locked away for hours, his cries for assistance unattended until, early the next morning he died of his injuries and illness. It wasn't until later that evening that a Jersey City constable found it within himself to review my son-in-law's indentification papers found within his pockets and venture across to Brooklyn to tell John's brothers in a most vile and cursory way, to come retrieve his body. My darling Mattie was inconsolable for many days afterwards while I and others suffered with outrage and indignation at the methods of the police department and in particular, one Captain Benson. Had it not been for this man, Mattie's husband might well be alive today. This man Benson's obstinance and ignorance was to blame! I was determined to see justice served and have him removed from his position and department altogether. Inquiries commenced including an autoposy on John to determine the cause of death which was as we had concluded all along, blood on the brain caused by a fall which in turn came as a result of sudden apoplexy! And still, with this knowledge the case was dismissed as mysteriously as it was managed. Carried out internally with no access provided for, to the family. The police captain responsible allowed to remain at his post. We buried John Faris on a late June evening that year in our family plot in Brooklyn's Green-Wood Cemetery. The sun's warmth falling upon our tear-strewn faces. It's Martha's hand I feel on the shoulder of my overcoat and Ellie May's hand covering mine as it rests upon my walking cane. She smiles, looking up at me. "Uncle, shall we go for ice cream now?"